So, this morning I had my 20 week ultrasound. Our little one was EXTREMELY active this morning and the sonographer had a difficult time keeping up. Fortunately, baby was not shy so we were able to find out with as much certainly as is possible that we are expecting a little boy. Allen and I are very excited and looking forward to really getting down to names and baby gear. 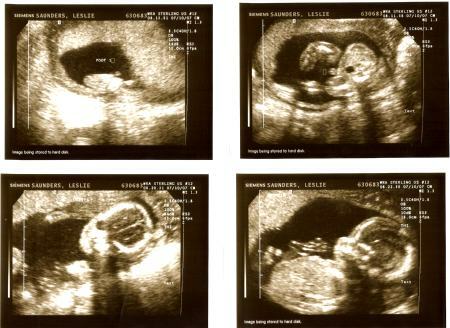 Based on the ultrasound, he looks healthy and has all the little parts that he should. Allen scanned in the pictures that they gave us. In stitching news, I got a good start on the next round of my neighborhood RR on Sunday. I am probably about a third of the way through. I really like what I chose, but I may have to find some more “stuff” to add to the sky. I have made a note to take a pic when I stop working on it tomorrow. 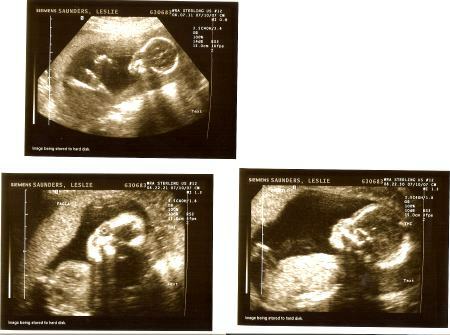 It’s amazing what you can see in thise pictures, I still have the pics of my scans when I was expecting my son. Hope everything continues to go well. How wonderful! The little guy’s already got a mind of his own! Congratulations! Ooooh! I love ultrasound pictures! They are very clear! Great pictures! Can’t wait to hear the what the name wil be. Awww – so sweet. Congrats on your boy! Wow, amazing photos! Hope everything continues to go well. Congratulations on your little boy! Great pictures. Congrats on a healthy baby boy!!! !